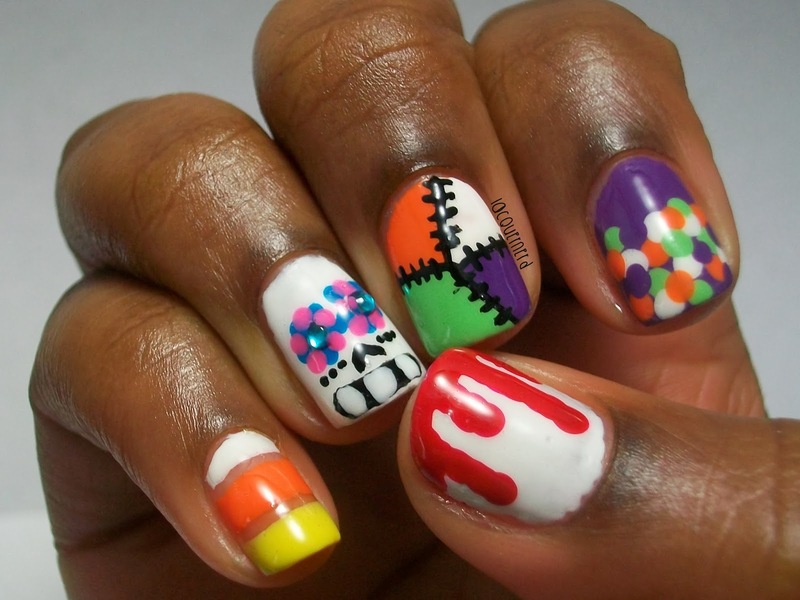 I don't really do holiday nails normally, but I decided to do some for Halloween. Halloween is probably one of my favorite holidays after Thanksgiving and Christmas. I really didn't want to do just one design on all my nails due to me being indecisive, so I decided to just do a mix n match of different designs. I'm going to apologize in advance for the photos with my thumb in it. The thermostat at my house isn't working at the moment and it's making my wrist tendinitis act up due to no heat, so my poses with the thumb look so awkward lol. For these Halloween nails, I did a variety of designs. For the pinky, I was inspired by candy corn. First, I placed two pieces of striping tape onto my nail. With my detail brush, I painted Wet n Wild's French White Creme, Sally Hansen's Sunkissed, and Sally Hansen's Mellow Yellow in the spaces. Once all the spaces were painted, I carefully took off the striping tape. 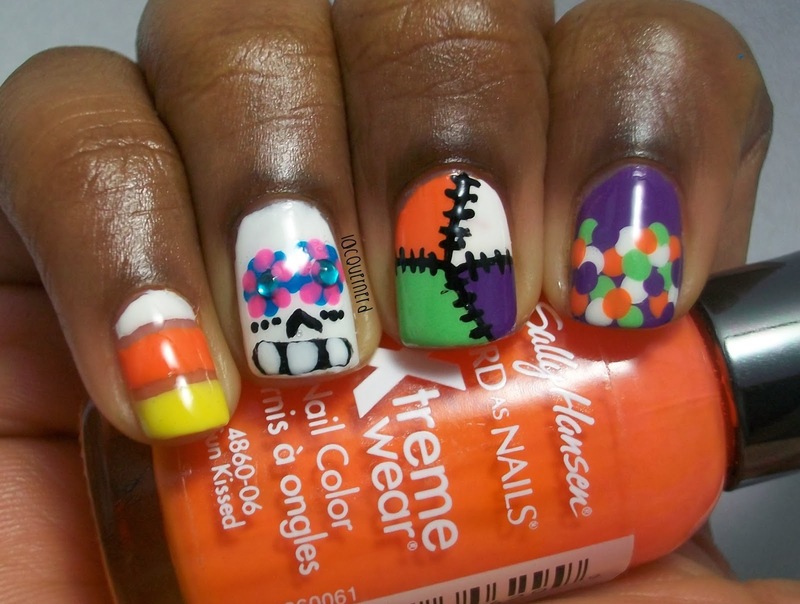 For the accent nail, I made a sugar skull. I first painted one thick coat of Wet n Wild's French Creme. Next, I put two drops of top coat on the nail to stick the gems on for the eyes. With my detail brush, I made two lines for the nose and a long black circle for the mouth with Sinful Colors Black on Black. Going back with the detail brush, I made white squares inside the mouth for the teeth with Wet n Wild's French White Creme. For the dots around the eyes, I used a small dotting tool and created dots with Sinful Colors Pink Forever and Sinful Colors Why Not. I finished it off with three small dots below the eyes using Sinful Colors Black on Black. For the middle finger, I was inspired by The Nailasaurus's Halloween Patchwork nails. I first painted two coats of Sally Hansen's Sunkissed. With a detail brush, I sectioned and filled in the different sections with different colors (Sinful Colors Pistache, Sinful Colors Amethyst, and Wet n Wild's French White Creme). Finally, I used Sinful Colors Black on Black to make the patchwork detail. For the pointer, I did a simple dotticure. I painted my nail one coat of Sinful Colors Amethyst. With a dotting tool, I created dots using Sally Hansen's Sunkissed, Sinful Colors Pistache, Wet n Wild's French White Creme, and Sinful Colors Amethyst. 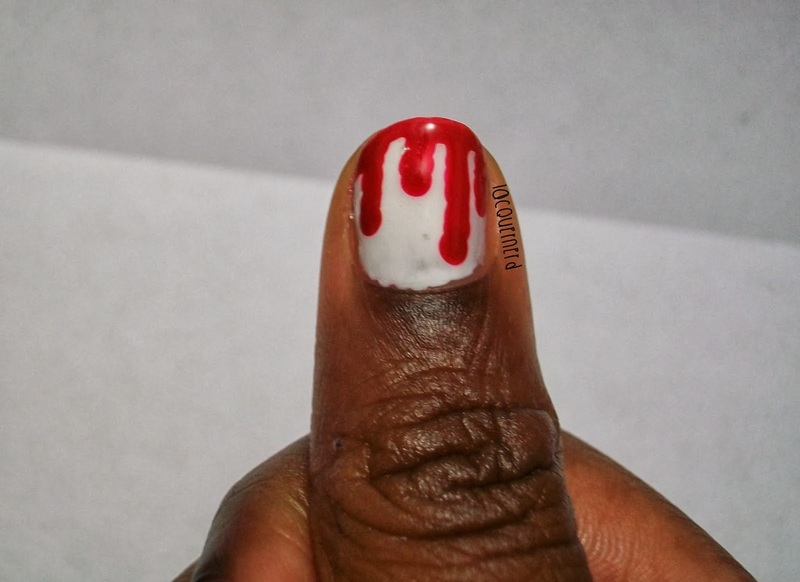 For the thumb, I created blood drips. I painted my nail one coat of Wet n Wild's French White Creme. With a dotting tool, I made four dots and connected them to the top of the nail making blood drips using Wet n Wild's I Red a Good Book. Finally, I made big dots at the tip of the drip. I finished off all the designs with Sally Hansen's Insta-Dri top coat. 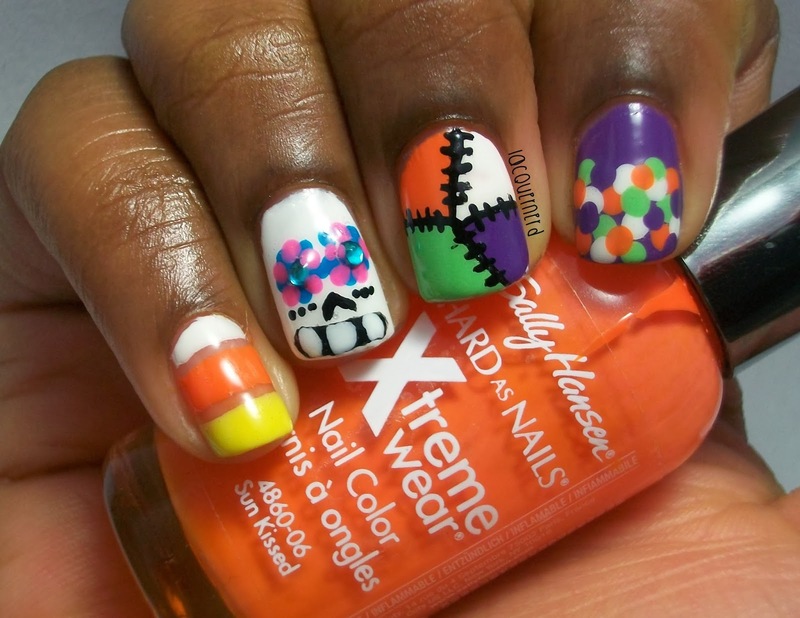 I really like these nails! They were fun to do. My favorite is the candy corn, sugar skull, and the blood drips. What design do you like best? Any plans for Halloween? 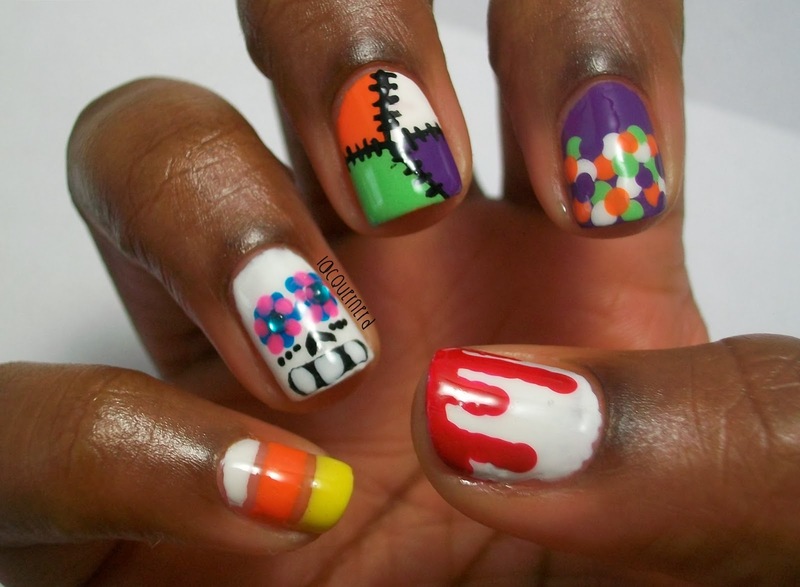 I like this Nail art Design! 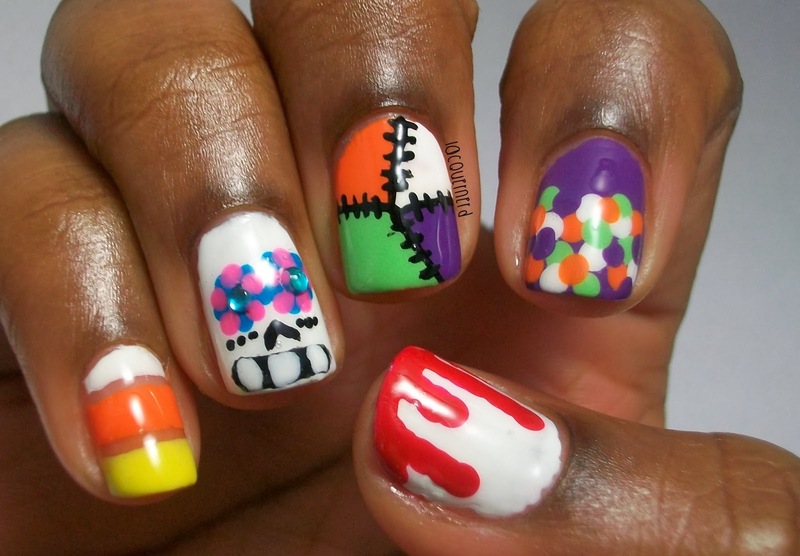 These are totally adorable--I love the colours!